Referee Dougie McDonald will return to Scottish Premier League action this weekend after he received a warning for lying about his reasons for a decision. The Fifa official from Edinburgh will take charge of Saturday's hometown match between Hibernian and Motherwell. McDonald has vowed to continue as a top official despite being reprimanded after an investigation by the Scottish Football Association. He had exaggerated his assistant's role in overturning a penalty award. That came on 17 October during Celtic's 2-1 win over Dundee United at Tannadice, where McDonald awarded a penalty after a challenge by goalkeeper Dusan Pernis on Celtic striker Gary Hooper. The referee changed the decision and told Celtic manager Neil Lennon that he had done so after being alerted to his mistake by assistant Steven Craven. McDonald subsequently admitted that it was own decision and insisted that it had been the idea of Craven, who resigned claiming he had been made a scapegoat, to make up a more credible explanation. An investigation by new SFA chief executive Stewart Regan issued a warning to the referee while backing his decision to overturn the penalty award. However, Regan has subsequently promised a campaign to increase respect for officials - and an overhaul of the system for overseeing referee performance. Meanwhile, opinion among players, managers and former referees has been divided about whether McDonald should resign, with some suggesting his position was untenable. 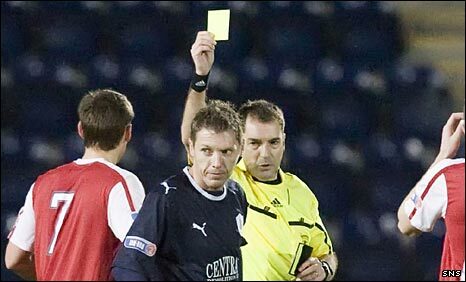 Despite that, McDonald has already returned to refereeing, handling First Division games at Dens Park and Falkirk Stadium. He has also been the fourth official at the SPL match between Hearts and Kilmarnock at Tynecastle.